Year after year there are articles commemorating the death of Sylvia Plath, it’s hard to read them. How can we commemorate the death of a brilliant mind? I was drawn to Sylvia Plath…her life was beautiful and tragic; her private struggles had become as famous as her poetry. After her suicide people blamed her husband, poet Ted Hughes. Right or wrong, the idea of Sylvia Plath Hughes evoked such anger that her married surname was repeatedly erased from her tombstone. This day is heartbreaking…not just because two children lost their mother but because a woman lost everything: her life, her privacy, and her future. February 11th is the day that happened. It is the day that others began to re-write Sylvia Plath, it’s the day they labeled her a tormented woman, a fragile soul, a vindictive wife, etc. We almost lost her poetry to those labels. So many biographers have tried to memorialize Plath in films and books, they’ve been unsuccessful; nonfiction on Plath and Hughes reads like a tabloid newspaper with unnamed sources. The countless biographies on Plath outline a troubled life and a detailed suicide, but there’s not much else. These biographers have a tendency to romanticize her illness or insinuate that Ariel was written in a manic state. They re-write Plath using her poetry. One could argue that some of these biographies are a shallow depiction of her, you won’t find Plath there. You’ll find Plath in her journals. It’s there you’ll discover the lemon meringue pie that she loved so much. She was a brilliant poet, “Sheep in Fog” is the most complex poem I’ve ever read. Even now I remain in awe of Plath’s Ariel, it’s chilling and transformational. In college I quietly researched a Plath topic for my English thesis but I decided against it. 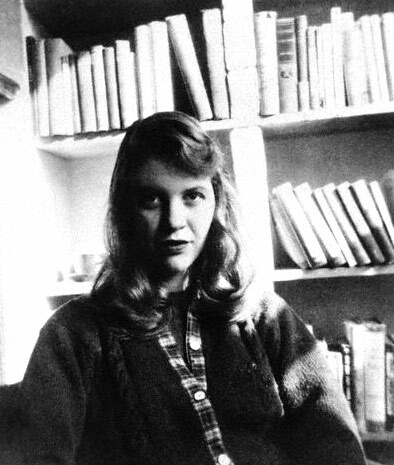 The labels have followed Plath and her readers: misunderstood, depressed, lonely, angst-filled girls. I knew many couldn’t see past them. I can’t see Sylvia Plath objectively. I can’t see her at all…I can’t imagine her horse, Ariel. No, I just imagine her in a Yorkshire grave; cold and still, but her words are alive. I wonder why I am still drawn to her…why two of her poems partially inspired my novel… and why I can’t let her go.